It's almost the 4th of July, and Americans are gearing up for cookouts. According to the National Retail Federation, 62.6% of Americans will host or attend a cookout, barbecue or picnic this year. Everyone knows that any decent 4th of July cookout will have hamburgers, hot dogs, corn on the cob, potato salad, and watermelon. But if you want to add some panache to your cookout, then consider buying a cedar grilling plank. Recently I was asked to do a product review for Fire and Flavor's cedar grilling plank. I was quite pleased with it. According to the company, the plank is made from all natural western red cedar and contains no additional flavorings. It was easy to use: I soaked the plank in water for the recommended 1 hour. (Don't skimp on the time, or the wood could burn too much when grilling.) I placed the salmon on the plank and set it directly on the heated grill racks. It cooked in about 15 minutes. I really loved the fragrance of the wood while it was cooking. It had a sweet, woodsy aroma that definitely whetted the appetite, as was evidenced by the people near the grill asking, "Mmm... what's that wonderful smell?" The salmon cooked evenly and maintained its shape perfectly. As for the taste, well, it was lovely. I can't say that it had a particularly woodsy flavor; it was more subtle. When I made beef on the plank, however, I detected a more discernible smoky flavor that was delicious. The meat was succulent and not overly charred as it tends to get when grilling. The plank can be washed in warm, soapy water, air-dried, and reused 1-2 more times, if not overly charred. The plank comes with clear, easy instructions and several great recipes. Overall, I would definitely recommend this product. Now for the best part! Fire and Flavor is offering a lucky Food Blogga reader a chance to win a Fire & Flavor "kit," with goodies such as a cookbook, cedar grilling planks, and cedar papers. Click here for details, and leave your comment below by the end of the day, Sunday, June 28, 2009! 1. In a small bowl whisk all ingredients from Dijon through black pepper. Using a pastry brush, coat salmon filets with the sauce. 2. Preheat grill to medium low (350-400 degrees F), and set soaked plank on grill rack. Close lid, and heat for 3 minutes. Flip flank over, and place salmon on top. 3. Close lid. Cook for 12-15 minutes, or until salmon turns pink and the flesh is opaque in the middle. 4. Remove plank from grill. Sprinkle salmon with sliced scallions and serve immediately. I want these babies for my maple glazed cedar planked salmon. Orange and ginger sounds to be a nice combination, looks grt! I'm dying to try a cedar grill plank, and almost bought one the other day. I'm glad to hear that they're worth using. Oh, and your salmon looks beautiful! This is my favorite method for cooking fish, by far and especially salmon. I soak the planks for a long time to make them last longer- like 3 hours if I can remember to start it early enough. I also have some hickory planks that are nice for pork. The giveaway sounds right up my alley! Count me in! I would love to try a cedar grill plank. Oh the salmon I could cook! I'd love to try using a plank--we've cooked using wood chips before but I would think that actually cooking on the plank would make the flavor even better! I'm thinking some kabobs--chicken, shrimp, beef, etc. YUM!! 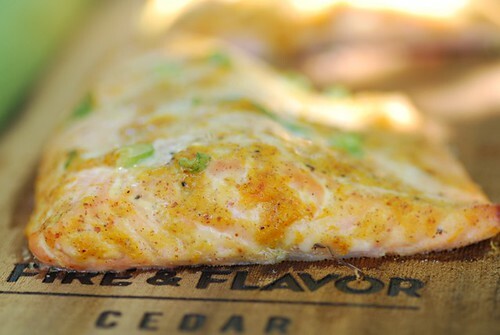 I'd love a cedar plank so I can try your delicious looking salmon!Yum! I've always wanted to try cedar grilling planks! Your fish looks wonderful. I have a recipe that calls for cedar planks, so I'm intrigued, and in on the contest! That sounds delicious, I hope I can win this! Mmmm...I love salmon on cedar planks! But seeing as my hubby's a vegetarian, I doubt I will ever make it. Do you think tofu would work on it? Oh, my husband would LOVE the grilling planks!! I bought some really inexpensive cedar planks and they are still sitting in a bag...I've been afraid to use them because they look like they would go up in flames even if they were soaked in water for hours! Lynn-I don't see why tofu wouldn't work, though I haven't tried it. Currently, I am a Culinary student, and I am working toward my bachelor's degree in Food and Beverage Management. I love to try new foods, whether the item is completely foreign to me or it's just prepared in a new way. However, money has been tight lately, I no longer have the funds to go out and buy new culinary equipment whenever I want to. I very rarely get to treat myself to something such as this. Cooking is my passion. I would love to win these planks in order to gain more experience and learn different techniques. I share the enjoyment I find in cooking with my friends and family, and preparing a meal is always the best way! Great giveaway, Susan! We use cedar planks all the time but I hadn't heard of the cedar paper. I Googled it and will have to try them as I've wrapped trout in butcher paper to grill... I bet it'd be great with the cedar papers. Don't enter me in the giveaway - we have a *stack* of cedar planks, but I'm glad to learn about the paper. I've never tried grilling with planks--we just got our first grill and so far, I've been afraid to be more daring than burgers and grilled peppers. Hopefully smoky wood plank flavor will force me to become more adventurous!! My e-mail address is jakannan AT vt DOT edu. Thanks for holding this giveaway! Great color on the salmons! I've never personally grilled with planks before but the flavor it imparts is extraordinary! Your salmon looks great! I've never used cedar planks but have wanted to try them since forever. i've always wanted to try grilling on a plank, but have never gottten around to it. this would be great! We have been grilling fiends with our friends and neighbors this summer and would love to have a cedar plank to add to our community grilling. Great food and great company, what more can you ask for? I've wanted to try grilling with cedar planks for such a long time! What a great way to prepare salmon and beef! I just had my first experience grilling salmon on a plank, with a mango/ginger prepared sauce that someone had given me. It was so so so delicious! It is my new favorite way to cook salmon. I would like to give cedar planks to a family member to share this discovery! Thanks for the recipe, we'll give it a try! I've always wanted to try grilling some fish (or beef, for that matter) on one of the grilling planks... seems like this would be the perfect excuse! The smell of cedar smoked fish- Is there anything better? I have had that at friends houses, but never dared to try it at home. I love that their boards are reusuable too! That salmon looks fresh & delicious Susan...can just imagine how beautifully flavoured it must have been. The cedar planks are too cool too. I smoke my stuff with a piece of red hot charcoal, but this seems different! That is a beautiful piece of salmon. Love the orange ginger combo. I'll have to give this recipe a try! I am not sure it took my message it told me my cookies were disabled so I will try again. Yumm those salmon look wonderful. Great recipe! I stumbled it... I would like to try this particular recipe on the cedar planks. I don't cook fish very often, and I need the practice! Reading through the comments - who knew salmon on a plank was such a phenomenon! Really like the sound of your fish as well as the plank, even if it's only for the gorgeous smell it's sure to give off. A bit of aromatherapy with your food. I would love to try this sometimes-- does the beef still develop that flavorful crust, even with the wet wood on it? Grilling on planks is such a great way to cook seafood - it stays moist and the flavor can't be beat. My planks are ready to be tossed, so I'd be excited to win these. this sounds absolutely lovely. Salmon cooked on a grill is one of my favorite things. Very nice Susan, I love Cedar planked salmon. Try doing rack of lamb on the plank - It's really excellent. Your preparation looks devine. Cedar plank salmon, sign me up. I would like to receive this grilling kit so maybe my husband will like salmon! That salmon looks amazing! I've recently gotten my husband into trying more fish...I know he'd enjoy it even more if he got to be the one to grill it on one of those fabulous planks! I've just purchased my first grill. It would be wonderful to try grilling on a cedar plank, especially since I live in Seattle, where salmon is adored. Mmmm I love fish cooked on cedar planks. Seriously no better way and it just seems so rustic and fun!! Yours looks delicious! My boyfriend absolutely LOVES grilling, and I know that he would have a fantastic time using a cedar plank. Having mentioned this possibility to him, he says that he is "obsessed with cooking and learning how to make new and exciting dishes, and a cedar plank would broaden my amateur repertoire". 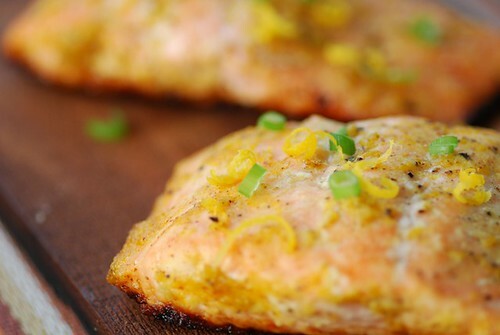 I had cedar plank cooked salmon in a restaurant before but never tried it at home. I love the idea of trying it with beef because getting too much char on your beef isn't too good for a body. My boyfriend's Birthday is right around the corner, and he would be so excited to receive these planks as a gift! Ever since my dad show him how to use the grill, he has absolutely -loved- grilling! We've barely used the stove, lol. We are very big fish eaters, since we don't eat beef, so he will definitely be giving this recipe a try! It looks amazing! My father is a commercial fisherman and I was raised on salmon. I've been wanting to try a cedar plank for YEARS. And I'd love to introduce my fishing family to something new. We've been just barbecuing or broiling it forever. Although I'm not a bbq master myself, my Dad is the grill king. His birthday is coming up, and I would love to get him this cedar plank. I know it would sizzle up some tasty new creations. 4th of July is my birthday and I already know what I am going to get: fireworks in all America land hehehehe... I just love grill but never make grilled fish before. Would love to try out! Um...I want to win so I can give this recipe a whirl, natch! I love cedar planks for cooking salmon. Great recipe! I always thought the cedar plank was a product of hype but your review has me reconsidering. I am eager to try it especially since I don't enjoy fish so I would use it on chicken or something similar instead. I am a fan of cedar plank cooking, the aromas are awesome. And your recipe sounds great Susan! No need to enter my name in the giveaway, let someone who doesn't have one win! That salmond looks amazing! I see you live in San Diego as well. Beautiful today. Have a great one! Here in Oregon have lots of salmon. I'd love it try it on a cedar plank! Brad and I FINALLY bought propane for our first gas grill. That we've had for two years and never used. I know. The horror. I always wanted to try the wood planks on my grill, thank you for the useful information! This looks GREAT. I have wanted to try these planks ... now I will have too! I want to cook more fish this summer and those cedar planks would be a nice place to start!